This section explains the rules for driving near tramcar systems. Special road markings represent the 'swept path' for trams and tramways. TRAM RULES: Most urban drivers are unlikely to see trams and tramways during their normal highway journey to work. Even so, streetcars are more commonplace abroad. So, drivers should be familiar with 'in the road' modern town tramway wire regulations. 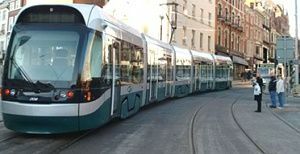 Understanding light rail systems, and the restrictions they demand, could be important any time you drive near trams outside the United Kingdom. As a rule, trams run on 'swept path' textured roadways. The same roadways get used by other road vehicles, walkers, and wayfarers. But, the slow-moving carriages are unable to move out of the way of traffic or pedestrians. Cars and inner city trams coexist safest when there are clear road markings. Thus, signs for trams are different in colour with bright and distinct signage. This section summarizes the trams Highway Code key laws for road users. It is useful for driving near tramways and anyone who may be in the presence of trams. Rule 300: If a road, a lane, or any other route is reserved for trams, you MUST NOT enter it. Use extra caution where trams run alongside the road. Avoid driving 'directly' on top of the rails. Take particular care where trams leave the main carriageway to enter the reserved route. Do not follow the tram in cases such as these. Note: As a rule, tram lanes get marked off by white lines, yellow dots, and a different texture on the road. Thus, the road surface distinguishes the width taken up by trams. Rule 301: Take extra care where the track crosses from one side of the road to the other. Use caution where the road narrows and the tracks come close to the kerb. Tram drivers get their instructions from their own traffic signals. Tram signs are usually diamond-shaped signs and white light signals. Always give way to trams. They may have permission to move when you are not. Never try to race or overtake trams. Do not pass a tram on the inside. It may be appropriate to move passed one while they are stationary at tram stops or stopped by tram signs and signals. If so, there may be a designated tram lane for you to pass. Rule 302: Parking or driving in tram tracks is dangerous. Tram drivers cannot steer around an obstruction. You should not stop on any part of a tramline, except in a designated bay. The location of the bay will be alongside and clear of the track. You MUST NOT park a vehicle where it would get in the way of trams or where it would force other drivers to do so. Rule 303: You MUST follow the route shown by the road signs and markings where a tram stops at a platform. It will be either in the middle or at the side of the road. You MUST NOT drive between a tram and the left-hand kerb when a tram has stopped to pick up passengers at a stop without a platform. If there is no alternative route signed you should wait until it moves off - do not overtake the tram. Rule 304: Look out for people getting off a bus or tram and crossing the road. Note: Drivers should look out for pedestrians, especially children, who may be running to catch a tram as it approaches a stop. Rule 305: Always give priority to trams, especially when they signal to pull away from stops, unless it would be unsafe to do so. Remember that they may be carrying large numbers of standing passengers. They could get injured if the tram had to make an emergency stop. Rule 306: Cyclists and motorcyclists should take particular care when driving or riding close to, and when crossing, the tracks. This is especially important if the rails are wet. You should take extra caution when crossing the rails at shallow angles, on a bend, and at a junction. It is safest to cross the tracks at right angles (perpendicular). Other road users should be aware that cyclists and motorcyclists may need more space to cross the tracks with safety. Rule 307: As a rule, tramway wire regulations determine overhead power wires to be a minimum of 5.8 meters above any carriageway. But, they may be lower in some situations. Always ensure you have sufficient clearance between the wire and your vehicle. Note: Remember to include any load you are carrying before driving under or near to any overhead wires. Ensure that equipment is fully lowered if you drive vehicles with extending cranes, booms, tipping apparatus or other types of variable height equipment. Height clearance markings show overhead wires set lower than 5.8 meters. The signage is like 'low bridge' road signs. Thus, you should note and observe the height clearances on these plates. You should contact the local police or the tramway operator if you are in any doubt on whether your vehicle will pass 'safely' under the wires. Taking a chance can be extremely hazardous!